On September 29, Detroit Children’s Fund hosted its 2nd Annual Dinner, supporting the improvement of K-12 public education in the city of Detroit. The event, chaired by Kim and Mark Reuss, Executive Vice President and President, Global Product Group and Cadillac, General Motors Company, raised a record $2.17 million through generous sponsorships and donations. Included in this total was a $1 million match from DCF board member Adam Levinson and his wife, Brittany. 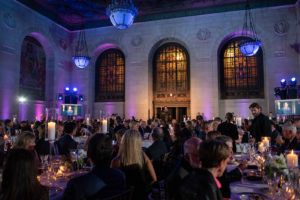 The Annual Dinner was held at the Detroit Public Library and had a sold out crowd of nearly 300 supporters. Guests enjoyed a strolling cocktail reception in the center of the library before heading upstairs to the library’s historic Strohm Hall for a formal dinner, program and live auction. The program was emceed by Morning News Anchor WDIV Local 4 News Detroit, Rhonda Walker, and included several notable speakers – DCF executive director, Jack Elsey; President and COO of Crain Communications, and Chairman of Detroit Children’s Fund board of directors, KC Crain; DCF Board Member and President and CEO of The Skillman Foundation, Tonya Allen; and event chair and GM executive, Mark Reuss. A live auction closed out the program and included five VIP experience packages for events like the Indy 500, ESPYS Awards Show, and the Rocket Mortgage classic. Combined, the auction items raised $121,000 for Detroit Children’s Fund, which contributed to the overall event total. Following the program, guests made their way to the after party in the library’s arts & literature room, where they enjoyed live entertainment by DJ John Arnold with percussionist Dan Austin; LED dancers from The Dancing Fire; custom cocktails and late night snacks. Major event supporters included: Host Sponsor, General Motors; Presenting Sponsor, Tom and Holly Gores with Platinum Equity; Hometown Match Sponsor, Brittany and Adam Levinson; Executive Sponsors, Barton Malow, Crain Communications Inc, Ilitch companies, Kojaian, Lear Corporatation, Edward C. & Linda Dresner Levy Foundation, and Magna; Platinum Sponsors, AVL Americas, Mary Kay & Keith Crain, Gretchen & Ethan Davidson, DTE Energy Foundation, Marlene & Bill Emerson, Fata Automation, FleishmanHillard, Gallagher Kaiser, Ghafari, Kenwal Steel Corp. and the Eisenberg Family, Quicken Loans Community Fund, The Suburban Collection; and Media Sponsor, Crain’s Detroit Business. For more information about the Annual Dinner, a full list of sponsors, and for the latest updates about the 2019 event, please visit detroitchildrensfund.org/annualdinner. 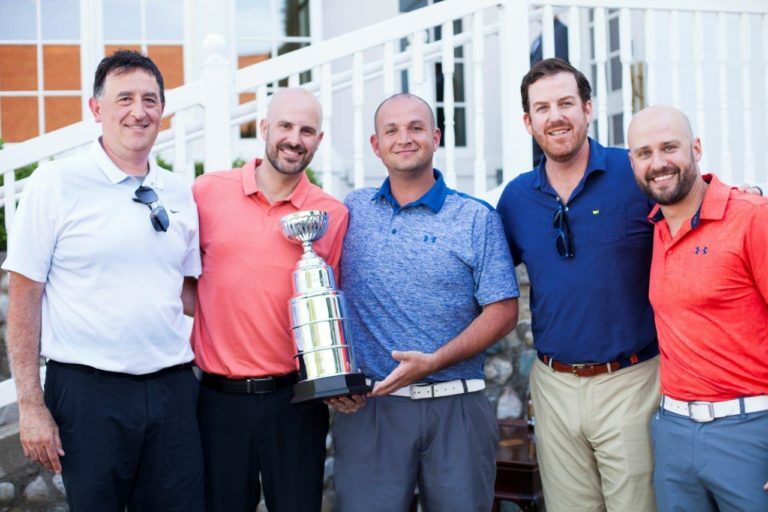 On Monday, June 25, Detroit Children’s Fund hosted its 2nd Annual Golf Outing – The Graduate Cup. Through generous sponsorships and donations, nearly $240,000 was raised to benefit Detroit schoolchildren. Detroit Children’s Fund (DCF) is a nonprofit organization that makes high-potential investments to expand successful schools, greatly improve lower performing schools and discover and develop talented educators so that one day every child in Detroit has the opportunity to receive an excellent education. Proceeds from the event will specifically support DCF’s investment in the Harvard Strategic Data Fellows Program with Detroit Public Schools Community District. This integral program will hire a team to create and implement a new data collection and reporting system for the district. Nearly 100 participants attended the golf outing, chaired by Arn Tellem, vice chairman of the Detroit Pistons. Attendees enjoyed an 18-hole scramble at the newly renovated Bloomfield Hills Country Club, a barbeque lunch and awards dinner. Golfers participated in contests throughout the course, including four chances to win brand-new Cadillacs, and one chance to win a Lincoln Navigator. The winning team — Rich Dolph, Ehren Gonzales, Nicholas Morrow, and Jeff Smith – was presented with The Graduate Cup. Sponsors for the event included: Title Sponsor, General Motors; Eagle Sponsors, Crain Communications Inc. and Detroit Pistons; Birdie Sponsors, AlixPartners, Gretchen and Ethan Davidson, Vera and Joseph Dresner Foundation, Christopher and Kelle Ilitch, Kojaian, Lear Corporation, The Lincoln Motor Company, Nelson Ventures, Mona and Matt Simoncini, syncreon, Systems Technology Group, Inc. (STG), and Toyota; and Hole In One Sponsor, Cadillac. Click here for a link to the photo gallery. Visit www.detroitchildrensfund.org for more information about DCF and upcoming events. On May 22, the Detroit Children’s Fund Women’s Ambassador Luncheon was held at Chartreuse Kitchen in Detroit. The event, hosted by Ashley Crain, Gretchen Davidson and Kelle Ilitch, brought together 50 influential women in the metro Detroit community, including philanthropists and community leaders, to learn about and discuss the work being done to improve Detroit education and how DCF is leading the way. Jack Elsey, DCF’s executive director, and Tonya Allen, founding board member of DCF and president and CEO of the Skillman Foundation, set the content of the conversation, discussing DCF’s mission to make high-potential investments to expand successful schools, greatly improve lower performing schools, and discover and develop talented educators so that every child in Detroit has the opportunity to receive an excellent education. Why do we need to recruit/grow schools in Detroit when we already have too many? Detroit is in desperate need of more quality schools. The city does have more capacity than it needs, but it does not yet have nearly enough quality schools to ensure every student has access to a quality education. Why is educator talent so important? As in any industry, high-performing educators get the best results. Study after study has shown that the single most important factor in a student’s learning is a quality teacher in their classroom every day. Strong school leaders develop and retain high-performing teachers, creating schools that have few, if any, gaps in instruction, ensuring that students can have a quality teacher every year without fail. Will DCF support after school programs, athletics, and other programs not directly related to academic outcomes or school quality? There are a significant number of organizations in the city, state and nationally that support these kinds of essential programs for schools and students. DCF’s mission is to dramatically increase the number of quality schools in Detroit and, while we believe that children should be engaged in a variety of ways outside the classroom, our investments will focus on opportunities that get at the heart of improving academic opportunity and outcomes—school improvement and expansion, educator development and recruitment and system-wide enabling conditions. The Detroit Children’s Fund (DCF) has launched a new $900,000 Team Fellows Program that aims to bring advisors into Detroit schools to provide intensive coaching to principals, assistant principals, deans and other top administrators. The coaches will work with school leaders together as a team to collectively create improvement plans, then work to implement them. The program currently operates at Mumford Academy and two Detroit charter schools. DCF sees the Team Fellows Program model as one that could expand to across the city and provide a positive growth environment and support system for emerging leaders in Detroit’s education community. To learn more about the program and the impact it is making in Detroit schools, read a new article by Erin Einhorn of Chalkbeat Detroit. Detroit Children’s Fund (DCF)—a nonprofit organization committed to ensuring that every child in Detroit has the opportunity to receive a quality education—has started the year with four additions to its roster of board members and a growing portfolio of investments. Tony Barra, Tony Cervone, Wright Lassiter III and Matt Simoncini—have been elected to the DCF board, a group of prominent Detroit philanthropists. “We’re grateful to have these individuals join to our slate of leaders, committed to improving education for Detroit children. Each have displayed a deep commitment to Detroit and its children, and bring valuable experience from their service on other local and national boards,” DCF Board Chair KC Crain said. Tony Barra is a retired technology consultant, whose expertise was focused on new business modeling and economic analysis. Barra also serves as co-chair of Eagles for Children at Meadowbrook Country Club. He has a bachelor’s degree in mechanical engineering from Kettering University, and a master’s in Business Administration from the University of Michigan. Tony Cervone is senior vice president, global communications at General Motors and oversees GM’s corporate giving activities. He is a 33-year veteran of the automotive industry. Cervone also serves on the boards of The LaGrant Foundation and Plank Center for Communications Leadership. He has a bachelor’s degree in journalism from Central Michigan University and was inducted into the Central Michigan Journalism Hall of Fame in November of 2017. Wright Lassiter III is president and CEO of Henry Ford Health System. He is a seasoned health care executive with more than 25 years of experience working in large, complex health systems. An avid community leader, Lassiter has held volunteer positions at the United Way, Salvation Army and YMCA; and serves on the boards of American Hospital Association, America’s Essential Hospitals, Federal Reserve Bank of Chicago, LeMoyne College, City Year Detroit, and YMCA-USA National Board of Directors. He has a master’s degree in health care administration from Indiana University, and a bachelor’s degree with honors in chemistry from LeMoyne College. Matt Simoncini recently retired as president and chief executive officer of Lear Corporation. 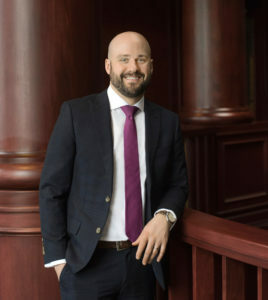 Simoncini also serves on the board of directors for the Wayne State University Foundation, Michigan Opera Theatre and The Parade Company. He has a bachelor’s degree in accounting from Wayne State University. The Fund’s mission is to make high-potential investments to improve the quality of education in Detroit’s K-12 public schools. These investments expand successful schools, significantly improve lower performing schools, and discover and develop talented educators. In 2017, DCF made its first investment in a high-performing charter school operator, New Paradigm for Education. The $5-million grant will help New Paradigm grow to accommodate more students, expanding quality school options in the city. New Paradigm high schools boast a 100 percent college acceptance rate. Its crown school, Detroit Edison Public School Academy, is the first and only Michigan charter school to be named a Michigan Exemplary Blue Ribbon School. DCF also recently launched its first talent development program, DCF Team Fellows. The program is a partnership with the School Empowerment Network to cultivate teams of principals and school leaders. Leadership teams will be provided strategic direction and support as they focus on their school vision, build an inclusive school culture, raise academic expectations, and create positive momentum for their school community. The first cohort in the Team Fellows program includes Detroit Achievement Academy, Detroit Prep (both public charter schools) and Mumford Academy (a DPSCD school). Detroit Children’s Fund will host its 2nd Annual Dinner on September 29th with Event Chairs Kim and Mark Reuss. Mark Reuss serves as executive vice president, global product development, purchasing and supply chain at General Motors Company. Detroit Children’s Fund is a nonprofit organization that makes high-potential investments to expand successful schools, greatly improve lower performing schools and discover and develop talented educators so that one day every child in Detroit has the opportunity to receive an excellent education.